will likely take several control measures to effectively get rid of those pesky rats feeding on your citrus trees. Coined "integrated pest management," adopting more than one control technique helps ensure pest elimination. 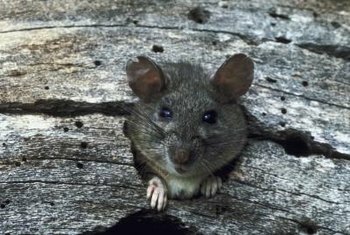 Whether they are roof rats also called black rats or Norway rats munching on your fruit, the average homeowner can usually eradicate them from the landscape without calling in the professionals. Prune citrus trees so they are isolated and do not touch other objects, including the ground, fences, wires, buildings and other trees. Maintain a space of about 2 to 3 feet whenever possible. Install rat guard around the trunks of the citrus trees. Use a sheet metal or aluminum flashing that is at least 18 inches tall and wrap it around the base of the tree, overlapping it by 2 or 3 inches. Drill or poke holes with an ice pick through the overlapping metal, two on the top and two on bottom. Thread a piece of wire through the top two holes and twist to secure. Repeat on the bottom two holes. This method to secure the guard around the tree does not harm the trunk. Pick fruit when it is first ripe. Remove dropped fruit and vegetation growing under the citrus tree, as rats do not like to be out in the open. Clear the debris in your landscape, including wood and brush piles. Keep wood piles, boxes and other items off the ground. Thin thick vegetation, such as an ivy ground cover or dense shrubs, to create a yard this is less desirable to rats. Store trash in sealed bins and do not unnecessarily keep water and food out for your pets. Trap rats with bait or snap traps, using bacon or dried fruit as bait. Do not use poison bait traps that are labeled as indoor use only. Set traps at the base of the citrus tree and throughout the landscape where you have noticed rat activity. Secure traps in the citrus tree itself using twine. If you use an anticoagulant wax block, set it in a bait station, which can be purchased or made with a plastic or cardboard box. The bait station protects other wildlife in the landscape. Set the bait station in the citrus tree, 6 feet off the ground. Rats generally stay within 300 feet of their nest or burrow to look for food.